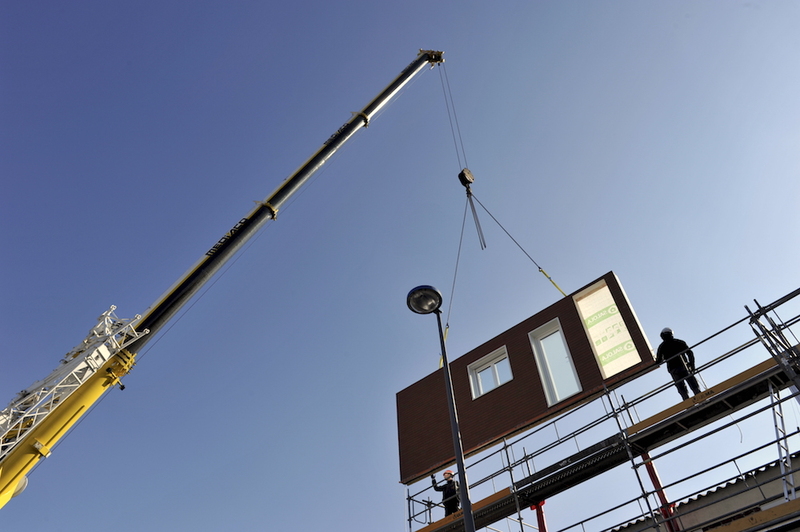 Net zero energy renovations continue to become a reality in France with the Energiesprong E=0 pilot project of Housing Association ICF Habitat Nord-Est in Longueau (Somme), coordinated by Bouygues Construction. On Monday 25 June social housing provider ICF Habitat Nord-Est took visitors behind the scenes of its net zero energy renovation project which consists of 12 upgraded houses in Longueau. It´s the second E=0 project in France using the innovative Energiesprong approach which will enable these social housing units from the 1960s to reach the net zero energy standard, with a 30-year performance guarantee. This pilot operation is co-financed by the Interreg North West Europe E = 0 programme and is supported by ADEME and Caisse des Dépôts. The 12 houses located in Longueau in the Somme are built in the 1960s and were chosen by ICF Habitat Nord-Est for their orientation, simple architecture and the need for refurbishment in the coming years. Collaboration and innovation are essential for the project to meet the Energiesprong performance standard. A group of partners mobilized by ICF Habitat Nord Est is working to achieve this: Bouygues Bâtiment Grand Ouest, the Ranson Bernier Architecture Studio, Dalkia, Alterea and Pouget Consultants. “The energy performance of housing is a concern for us social landlords and also a key issue for our tenants and for the planet. The Energiesprong approach is innovative in terms of the time and efficiency of the works and the 30-year guarantee. ICF Habitat Nord-Est is proud to be one of the pioneers of this approach that opens the way to new possibilities for low energy renovation” said Christine Richard, General Manager of ICF Habitat Nord-Est. The original facades have been captured digitally, making it possible to design and prefabricate new 40cm thick facades to insulate the houses. These facades have helped lift the Energy Performance Certificate rating of these homes up to A. They were rated D or E before. Heating, controls and solar PV systems are integrated before they are placed on the existing house. All heating equipment is installed outside the house for easy maintenance. Annual electricity production from the solar panels is estimated at 7,000 kWh per dwelling. This covers the electricity consumption of each home. The energy savings achieved make it possible to finance part of the work. There’s also less worry for the tenants thanks to the shorter intervention times and the approach which limits the rise in energy costs, with a guarantee of efficiency for 30 years. 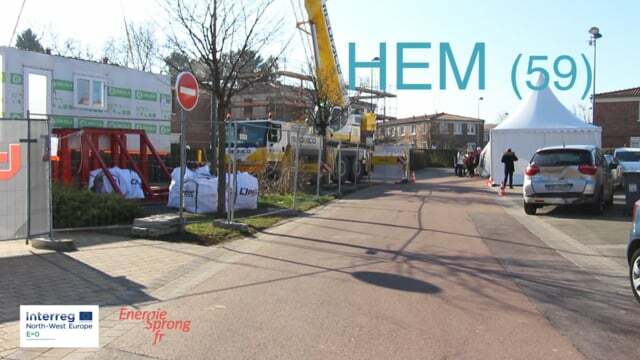 ICF Habitat Nord-Est’s pilot, coming in the wake of another conducted by Vilogia in Hem, confirms that the Energiesprong approach works in France. The demonstrator projects are helping to point the way to lower-cost retrofit. Now, having shown the concept works both technically and legally, a period of user feedback, improvements and scaling will start, aiming for more renovations across more regions leading to lower costs. The retrofit in Longueau, will be finished in July 2018. The two demonstrator projects in France are part of a larger movement. 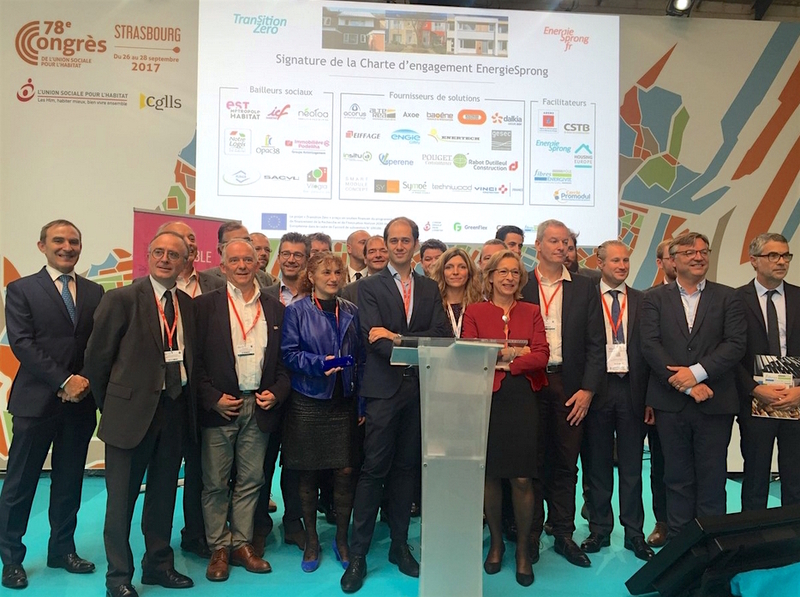 In October 2017, 36 organisations (including 9 social landlords) signed a charter including a collective commitment to renovate 3,600 homes using the Energiesprong approach, with support from the European H2020 Transition Zero programme. In October 2018, new partners and new solution providers will enter a second phase of this commitment during the HLM conference. The virtuous circle has begun. It is promising, but it needs to grow, with more projects and more territories. After two pilots and 22 renovated homes, France can’t match the lower price levels reached in the Netherlands yet, but this doesn’t surprise – the Dutch didn’t achieve these economies of scale until they’d renovated 1000 homes. The E=0 demonstrators in Longueau are part of the Interreg North West Programme funded by the European Union. The E=0 project supports the deployment of a first wave of pilots in the UK, France and Luxembourg, and is expected to lead to a larger volume commitment in these countries and the Netherlands. This support makes it possible to co-finance net zero energy pilot renovations in these countries, to extend the movement in North-West Europe by promoting the sharing of knowledge between partners and to help deploy better solutions over time.